World Leprosy Day 2014 calls for a massive, concerted, united effort to raise awareness about leprosy and the problems created by this chronic but curable disease. It is not enough to know about leprosy–we all have to ACT WITH A SENSE OF URGENCY in order to prevent and address the physical, psychosocial, and economic problems that leprosy brings. Today is also a day of prayer for leprosy patients, their loved ones, and cured patients who struggle to be productive members of society–may they continue to have faith and to heal. Let us also pray for leprosy workers, public and private agencies who could help, and all those who are already assisting leprosy patients–may we truly work together for a world that is free of the worst aspects of leprosy–free from disability, stigma, and discrimination. Where can the patient go for evaluation/biopsy? please give recommendations. The patient is located around Makati-Mandaluyong area. Hello! We at Phil. 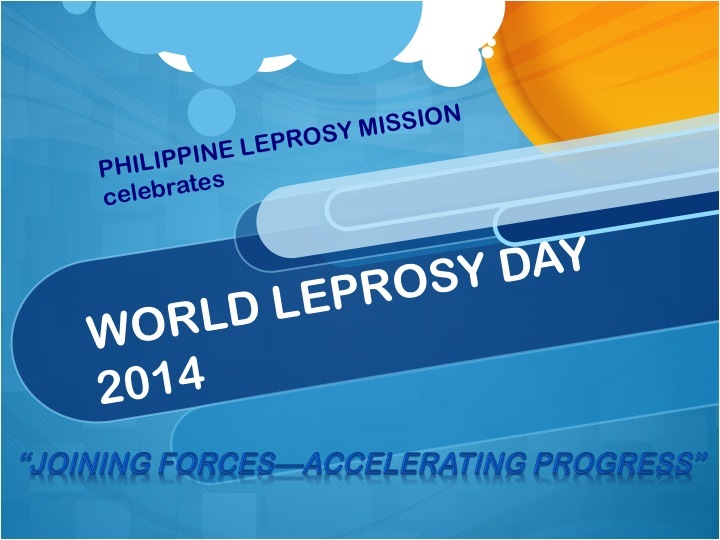 Leprosy Mission would like to follow up with you. Were you able to go to government hospitals-dermatology department for evaluation? Please let us know. you can reach us in our landline 332-1735 or 09185619831.